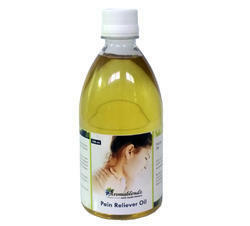 Offering you a complete choice of products which include aromablendz joint pain relief oil, aromablendz kesh yug tail, aromablendz ayurvedic pain relief oil, aromablendz shirodhara oil, aromablendz abhyanga taila and aromablendz abhyanga taila with citrus extracts. A very versatile preparation, excellent for muscular sprains, spasms, ligament strains, tendonitis, sciatic and gout. Also swelling in the surrounding connective tissue due to joint ailments or progressive stress injuries like lower back pain, cervical pain, knee pain, elbow pain etc. Excellent for cough, colds and sinusitis due to presence of nilgiri extracts. Steam inhalations by throwing a cap full of oil in boiling water will relive congested nasal passage. Oil extracts of Unmeta Patra, Nagaram, Oil nilgiri, Oil Sugandhi Toorna, Oil Lavanga, Peppermint Phool, Chinak in the base of Oil devdaru and winter green oil. Gentle massage on the painful area without pressure in circular and simple sliding strokes till the oil is absorbed in the skin. For best results in acute pain apply hot water fermentation before applying the oil at least thrice a day and compress with bandage around the inflamed area. Do not heat the oil. Avoid application on infected areas of skin like scabies, ulcers, eczemas, psoriasis, prickly heat and open wounds. 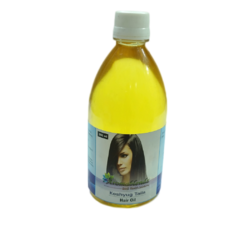 Use & Benefits: Kesh Tail is a herbal hair oil which prevents hair fall, premature graying of hair, control dandruff and stop baldness, Stops hair fall, darkens hairs, makes hair shiner and attractive, nourishes scalp. Application: Apply it to the hair roots, massage well. To have more effect it should not be washed out. Used to: Alleviate pain in muscle, ligament strains, spasms, tendonitis, sciatic and gout. Treats swelling in joints and is excellent for inhalation treatment in cough and cold. Benefits: A very versatile preparation, Aromablendz Joint Pain Management Oil is the perfect blend for treating muscular sprains, spasms, ligament strains, tendonitis, sciatic and gout. It is also used for treating swelling in the surrounding connective tissue due to joint ailments or progressive stress injuries like lower back pain, cervical pain etc. Excellent for cough, colds and sinusitis due to presence of Nilgiri extracts. Composition: Oil extracts of UnmetaPatra, Nagaram, Oil nilgiri, Oil SugandhiToorna, Oil Lavanga, Peppermint Phool, Chinak in the base of Oil devdaru and winter green oil. Use & Benefits: "Shiro," means head, and "dhara" is the continuous flow of a liquid. This treatment is profoundly relaxing, nourishing. It will improve your mental clarity and comprehension. 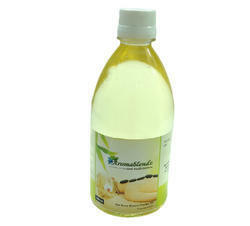 It also prevents hair fall, premature graying of hair & controls dandruff. Application: Apply as adviced by your Ayurvedic Physician. To be used in Shrodhara Therapy. Keep for minimum of 2 hours post therapy. Massage is a very integral form of Ayurveda, also knows as “Abhyanga”, meaning application or rubbing of oil. 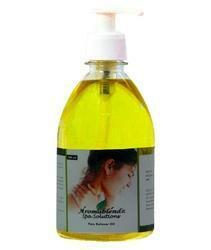 Ayurvedic oils go thru stringent extraction and preparation processes. They have blends of sesame and til oils along with added herbs that have anti inflammatory& restoration properties. 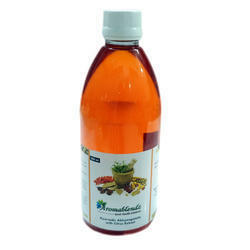 Our product the Ayurvedic Abhyanga taila is a simple & effective blend of sesame oil with ayurvedic herbal extracts. It is prepared meticulously to ensure it preserves all the natural properties & provides therapeutic relief on application. Cautions: Avoid ingestion and application in the eyes. Avoid use with bleach and other chemical treatments. Don’t mix or blend with any other oils. Storage: Store in a clean dry place. Moisture and heat tend to reduce its shelf life. 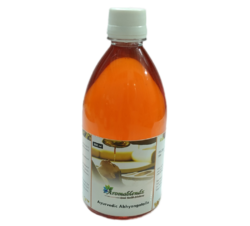 The Ayurvedic Abhyanga Taila with citrus extracts is a blend of sesame oil, pure ayurvedic herbal extracts and added vitamin C derived from natural sources which acts as an anti oxidant and improves collagen production in the skin. Caution: Avoid ingestion and application in the eyes. Avoid use with bleach and other chemical treatments. Don’t mix or blend with any other oils. Storage: Store in a clean, dry place. Moisture and heat tend to reduce the shelf life. Use in massages which focus on healing & recovery, like the Hot/Cold Stone Chakra treatment. Its soothing fragrance & muscle penetrating properties help relieve tension & trigger inner healing processes while realigning elements of the body. Gently massage with hot or Cold stones all over the body. 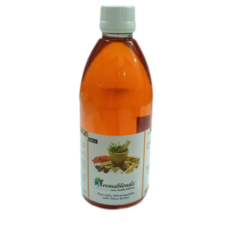 Use & Benefits: The Ayurvedic Abhyanga Taila with citrus extracts is a blend of sesame oil, pure ayurvedic herbal extracts and added vitamin C derived from natural sources which acts as an anti oxidant and improves collagen production in the skin. Composition profile: Sesame Indicum oil, Citrus extracts, Caucus Nucifera, cedar deodar, Somnifbra, Santalum album & elettarria cardamom. Caution: Avoid ingestion and application in the eyes. Avoid use with bleach and other chemical treatments. Don?t mix or blend with any other oils. Storage: Store in a clean, dry place. Moisture and heat tend to reduce the shelf life. 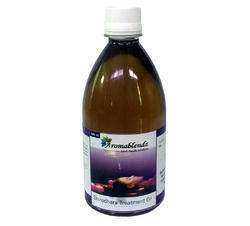 Looking for Aromablendz Ayurvedic Range ?